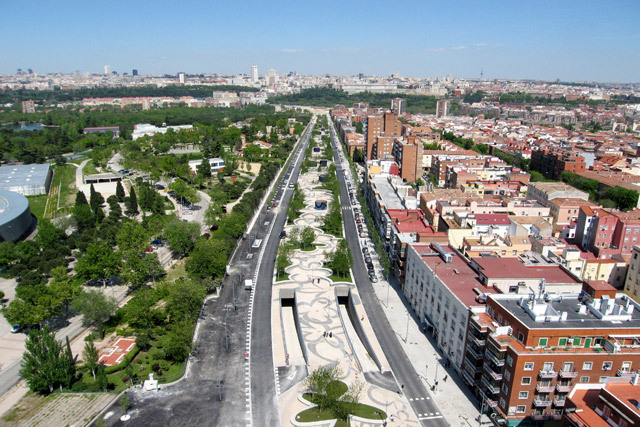 The ambitious plan by Madrid’s mayor Alberto Ruiz-Gallardón to submerge a section of the M30 ring motorway immediately adjacent to the old city centre within a tunnel was realised within a single term of office. 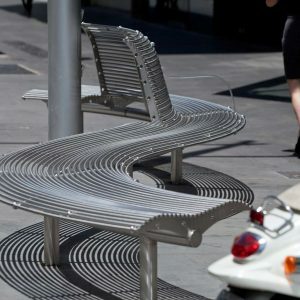 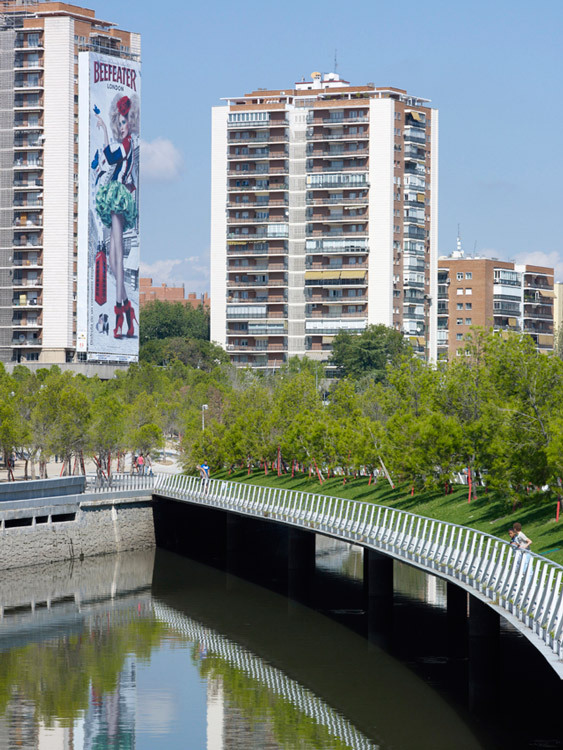 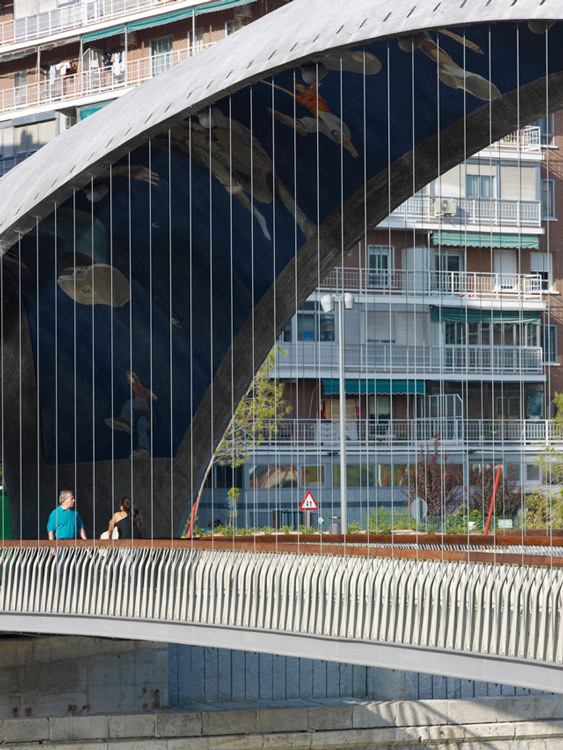 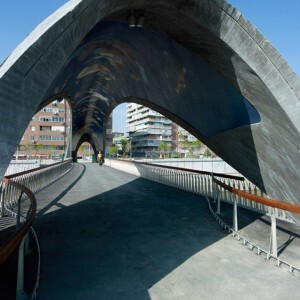 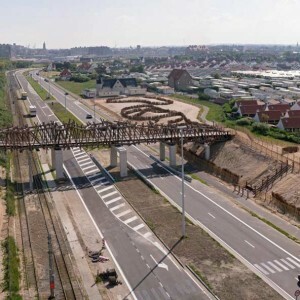 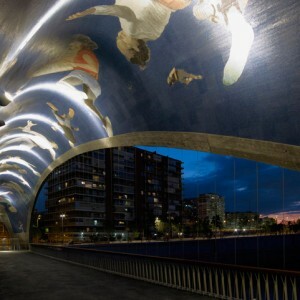 The city undertook infrastructure measures over a total length of 43 kilometres, six of them along the banks of the River Manzanares, at a total cost of six billion Euro. 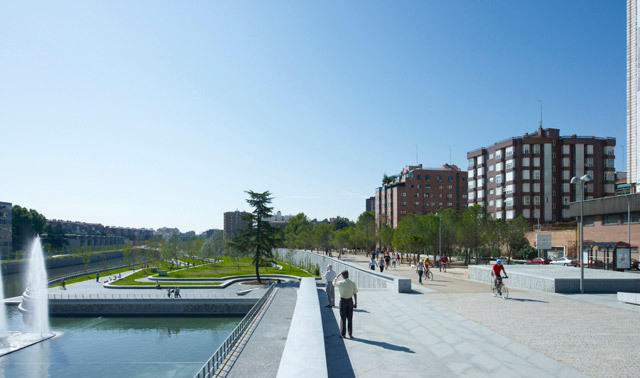 West 8 together with a group of renowned architects from Madrid, united under the name MRIO arquitectos led by Ginés Garrido Colomero designed the master plan for Madrid RIO. 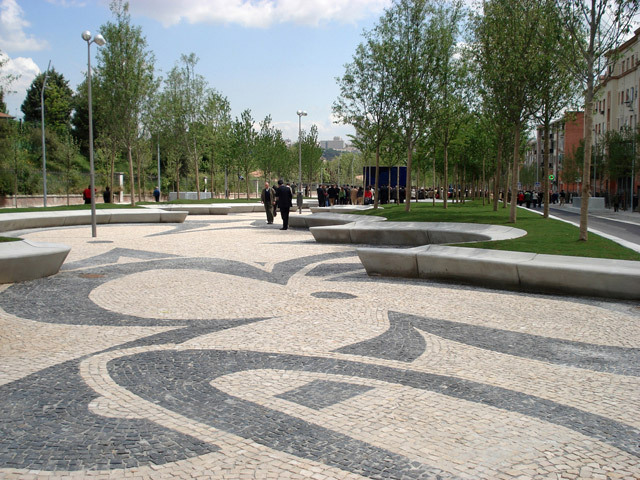 In 2005, an invited international competition was announced. 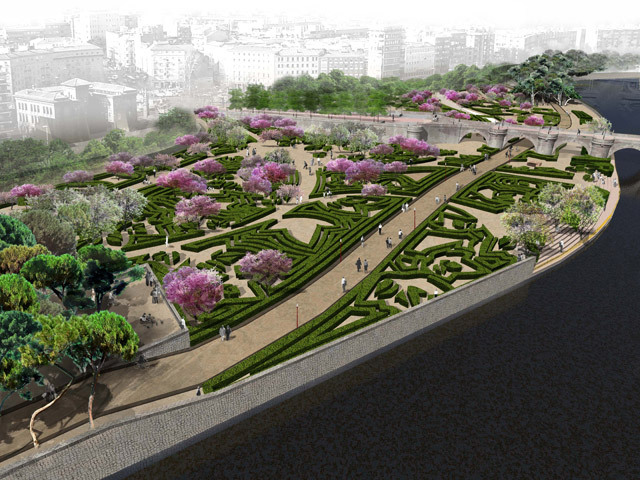 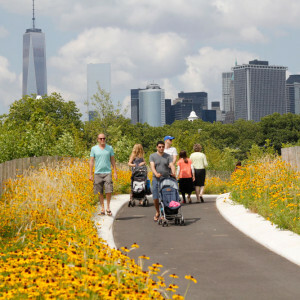 The proposal submitted by West8 and MRIO for the design of the reclaimed area above the tunnel was the only submission to resolve the urban situation exclusively by means of landscape architecture. 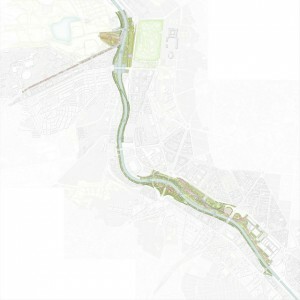 The design is founded on the idea »3 + 30« – a concept which proposes dividing the 80 hectare urban development into a trilogy of initial strategic projects that establish a basic structure which then serves as a solid foundation for a number of further projects, initiated in part by the municipality as well as by private investors and residents. 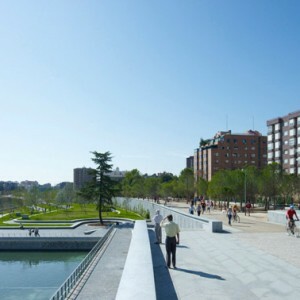 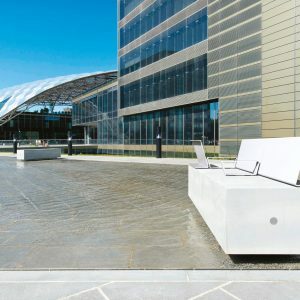 A total of 47 subprojects with a combined total budget of 280 million Euros have since been developed, the most important of which include: the Salón de Pinos, Avenida de Portugal, Huerta de la Partida, Jardines de Puente de Segovia, Jardines de Puente de Toledo, Jardines de la Virgen del Puerto and the Parque de la Arganzuela. 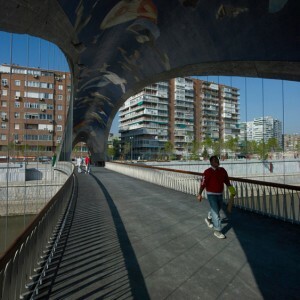 In addition to the various squares, boulevards and parks, a family of bridges were realised that improve connections between the urban districts along the river. 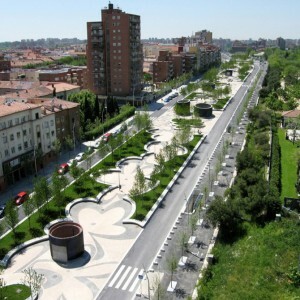 The first subprojects were realised in spring 2007. 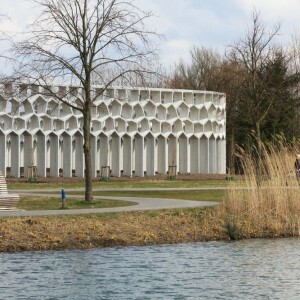 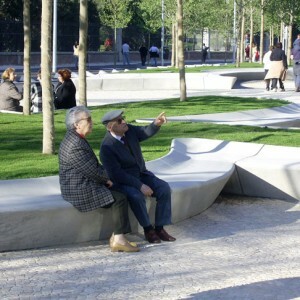 The realization of the whole project is planned for spring 2011. 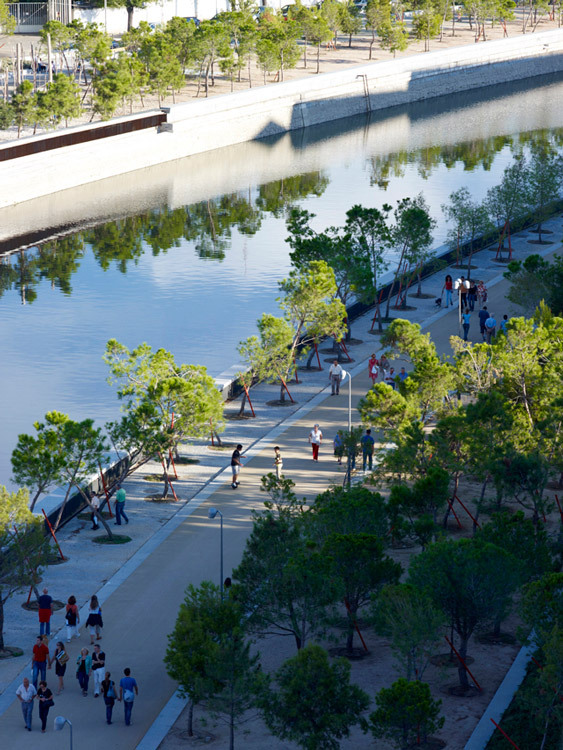 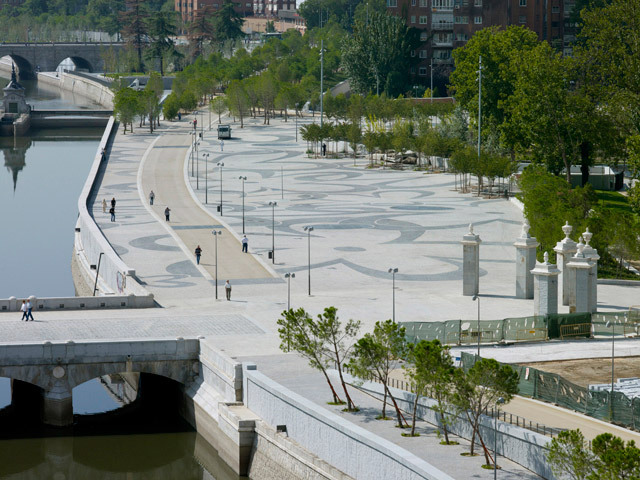 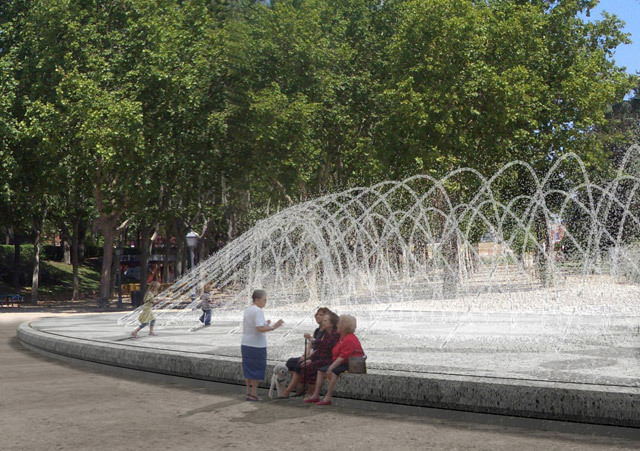 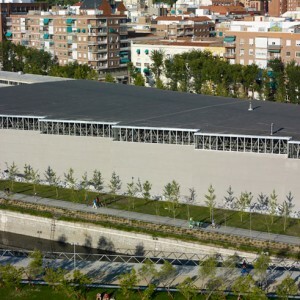 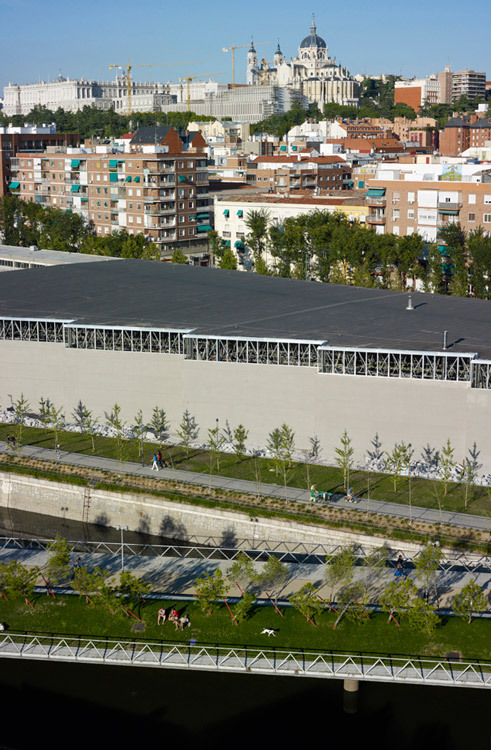 The Salon de Pinos is designed as a linear green space, which will link the existing and newly designed urban spaces with each other along the Manzanares River. 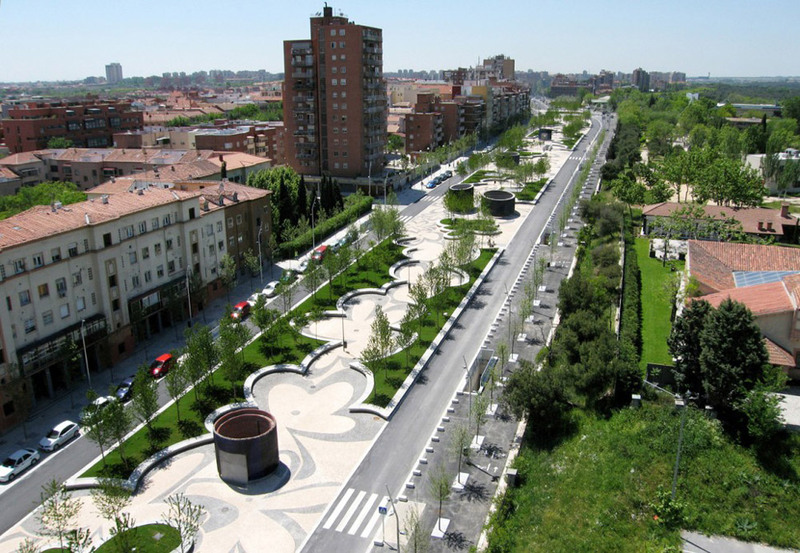 located almost entirely on top of the motorway tunnel, the reference to the flora of the mountains was chosen for the outskirts of Madrid. 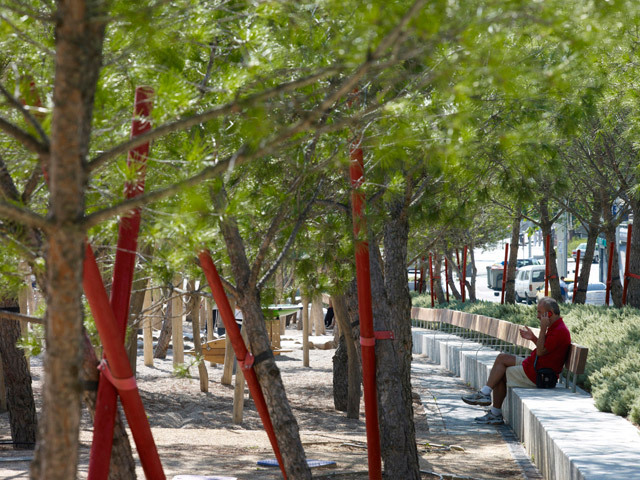 The pine tree which is able to survive on the barren rock is planted in more than 8.000-fold. 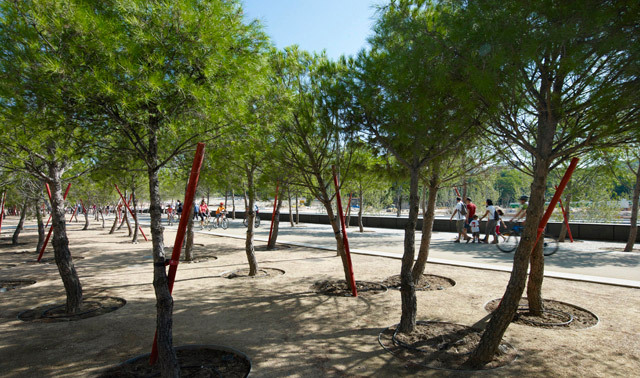 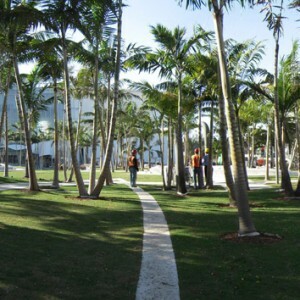 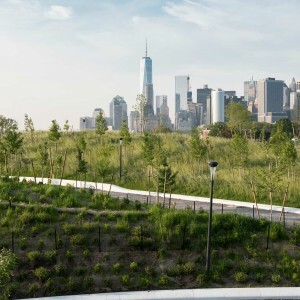 A “choreography” of the tree planting with a repertoire of cuts, selection of grown characteristic trees, combined and inclined planting leads to a natural and sculptural character of the space to create a botanical monument. 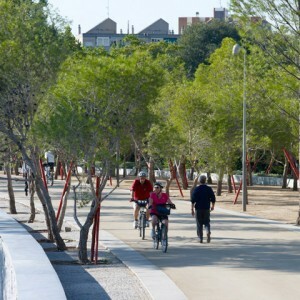 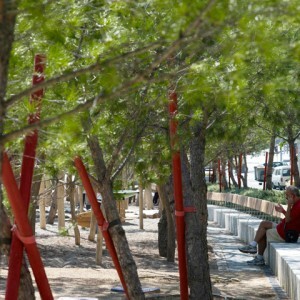 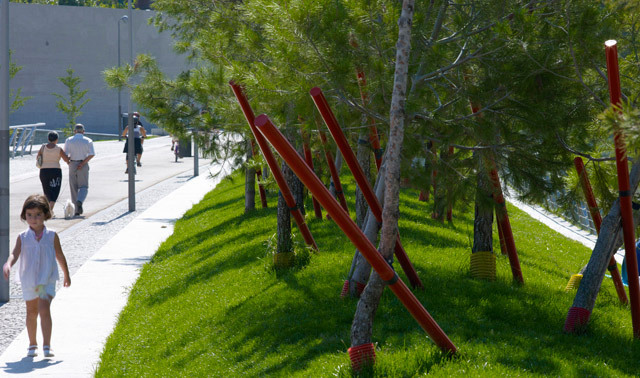 A variety of tests, carefully selected plants and materials, the design of a tree support with refers to the bull’s horns and the technical solutions of the structure of the substrates in the tunnel document the complex nature of this park in the city. 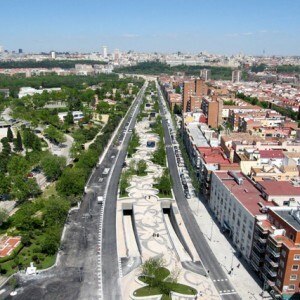 The Avenida is one of the most important roads into the centre of Madrid and is characterized by its impressive environs. 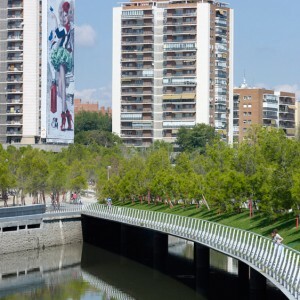 The motorway lies at the boundary between one of the most densely-built residential quarters and the Casa de Campo – formerly the Spanish king’s hunting grounds – and from far away offers an impressive view to the historic city centre on the banks of the Manzanares. 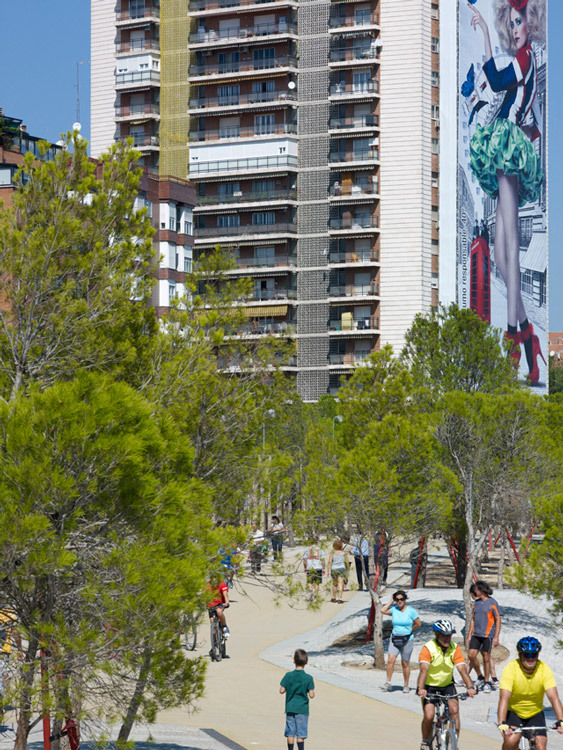 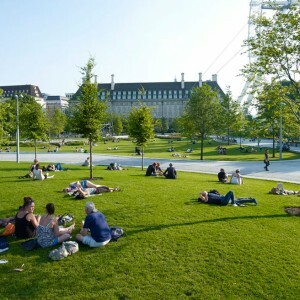 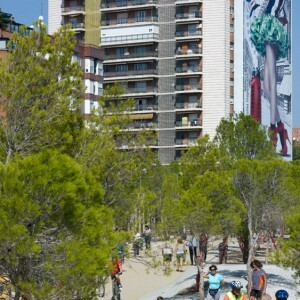 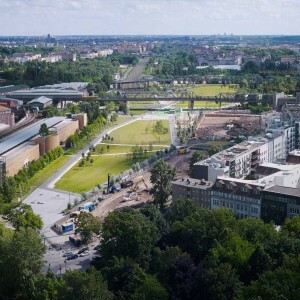 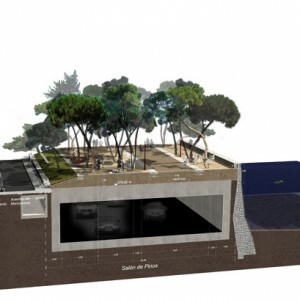 By relocating the road in a tunnel and providing underground parking for 1.000 vehicles, it was possible to convert the space into a garden, benefitting the local residents in particular. 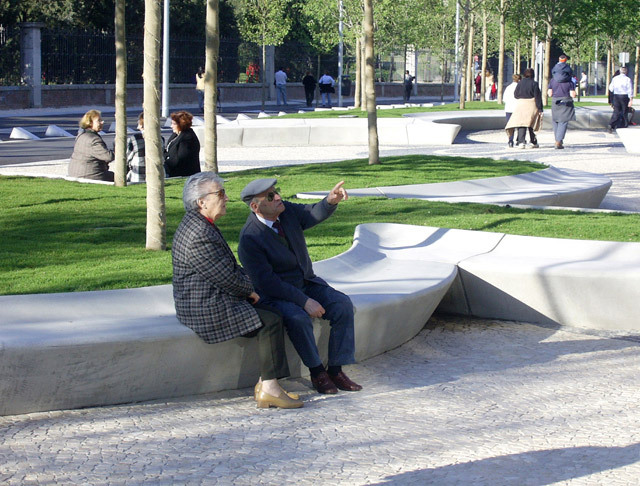 The design takes a journey to Portugal as its theme – the extension of the Avenida de Portugal leads towards Lisbon, in the process crossing a valley famous for its cherry blossoms in the otherwise extremely barren and inhospitable climate of the Estremadura. 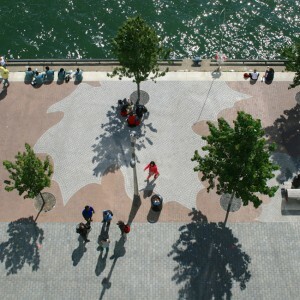 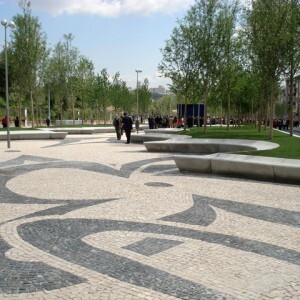 The abstraction of the cherry blossom as a design element of the park, the planting of different kinds of cherry trees to extend the period in which they flower, the reinterpretation of the Portuguese paving and the connection of the space to its surroundings has led to the creation of a popular public space. 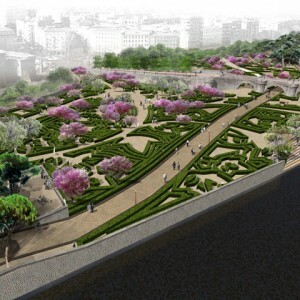 The City Palace was built as a Baroque ensemble with a strict choreography that connected the Royal Palace with the hunting grounds and the fruit and vegetable garden at the other side of the river. 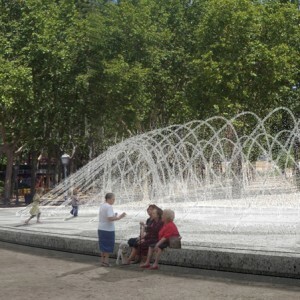 Through the infrastructure changes of the fifties the orchard was turned into a transportation hub. 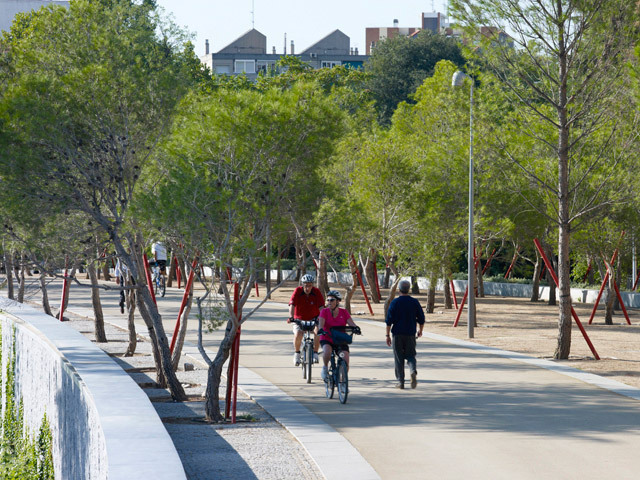 Contrary to the initial tendency to create a historical reconstruction, the Huerta is now a modern interpretation of the orchard. 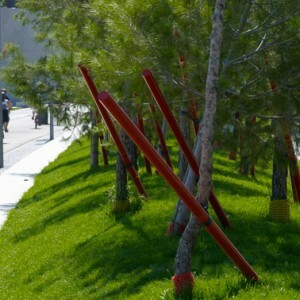 The motive of the hortus conclusus has been formed with a wide variety of fruit trees in groups, formed from skipping ranks. 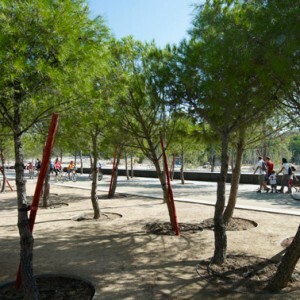 Fig trees, almond trees, pomegranate and more of such plantings symbolize paradise in the past. 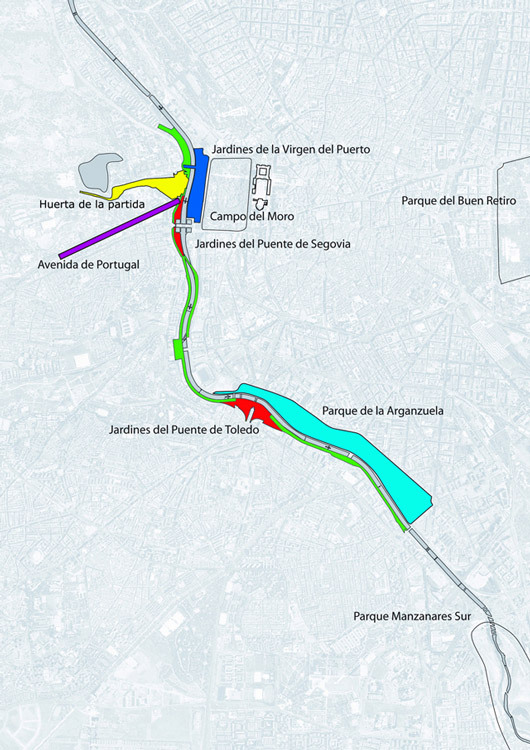 The in recent decades undertunneled river is meandering again through the room. 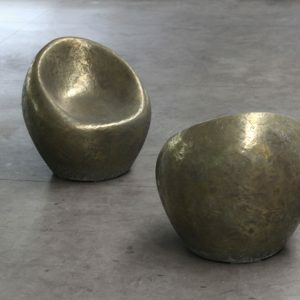 Its source and the mouth are specially shaped. 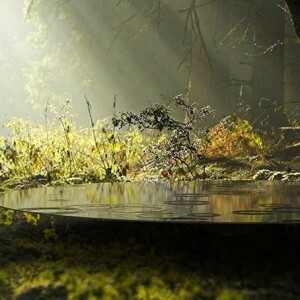 From the cave, which sets the end point of the watercourse the scene gives the viewer the image of the ensemble intact again – the combination of the elements of the Baroque city castle. 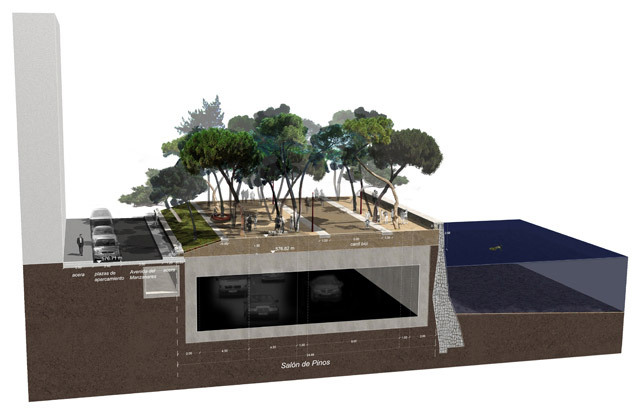 As a consequence of the design there is a new entrance to the Casa de Campo that logically connects to the public space. 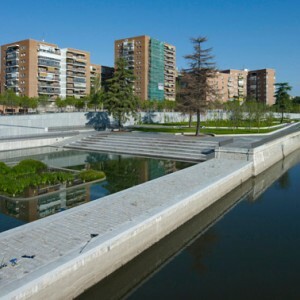 The dominating motive for the biggest part project is the water. 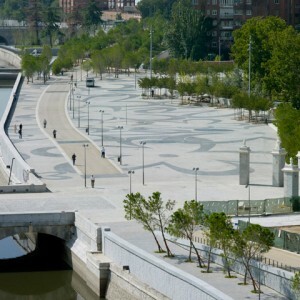 The canalized and damped river Manzanares is surrounded by his architectonical walls. 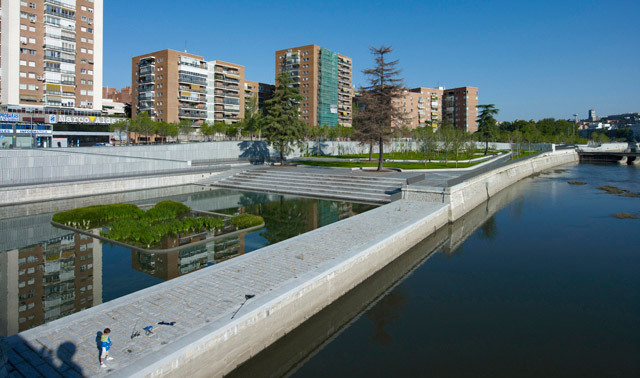 The park is based on the different emotions and landscapes in context of the water makes this element feelable and explorable. The system of streams is running through the park and will form in the crossings and though the topography different spaces and motifs. 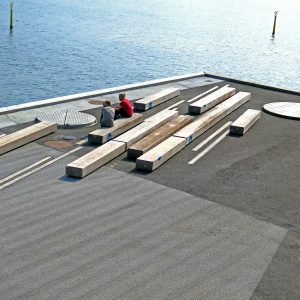 The different streams have their own characters. 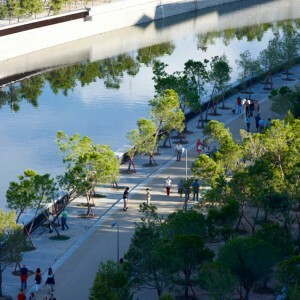 The Rio seco for example is an interpretation of the dry rivers of the Spanish landscape in which you feel the presence of the water in any season but throughout the year only the freshness of the vegetation along the riverbed and pebbles on the riverbed are visible. 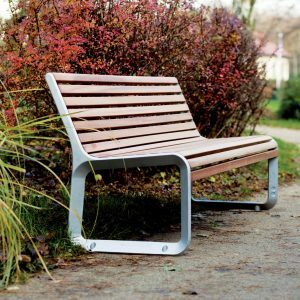 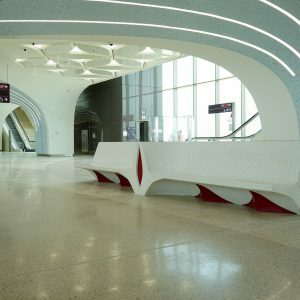 Botanical variety will create different atmospheres in the artificial leas and will allow a clear structuring of the spaces with high variety of different moods. 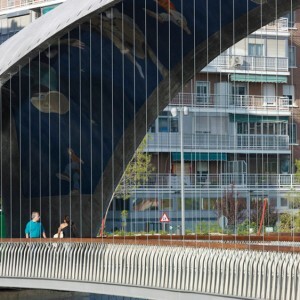 In contrary to usually technical and pragmatic pedestrian infrastructural bridges they create a place where the river is really experienced. 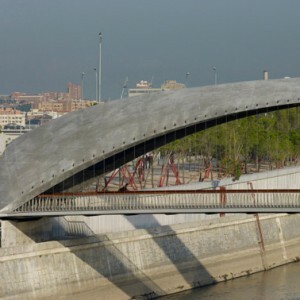 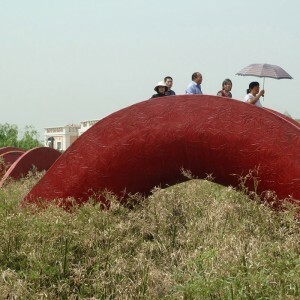 They are designed as a massive concrete dome with a rough texture. 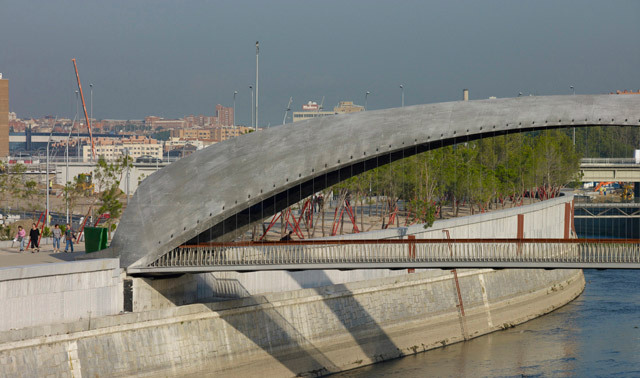 The bridges have the scale of park elements and not of the infrastructure. 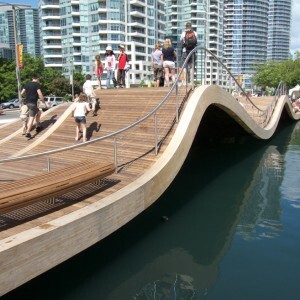 More than one hundred cables resembling whale baleens wearing the slim steel deck. 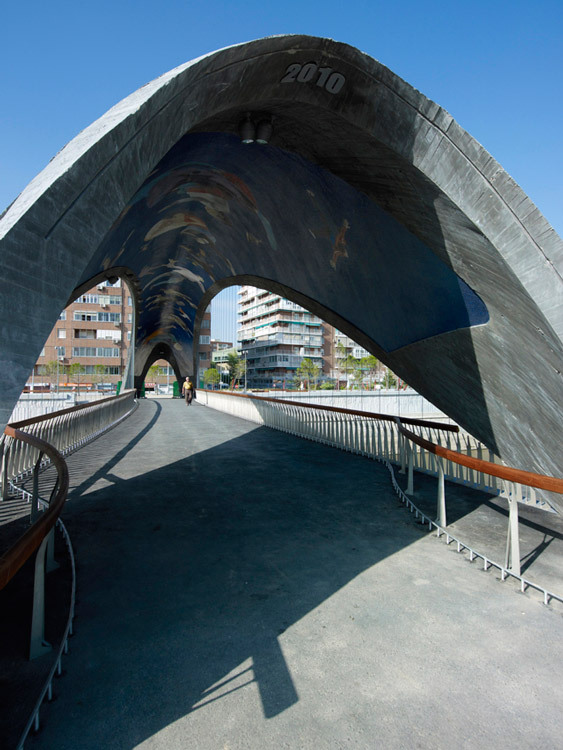 The fine detailing becomes visible when entering the bridge. 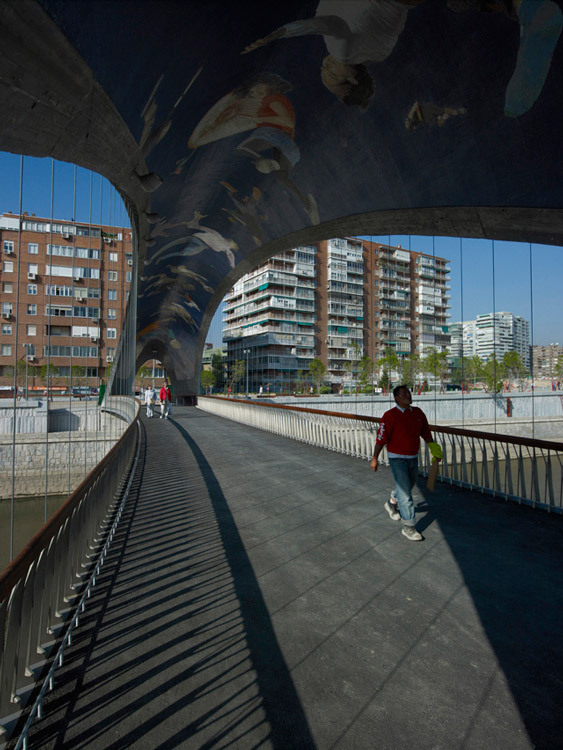 The ceilings have a mosaic of the Spanish artist Daniel Canogar. 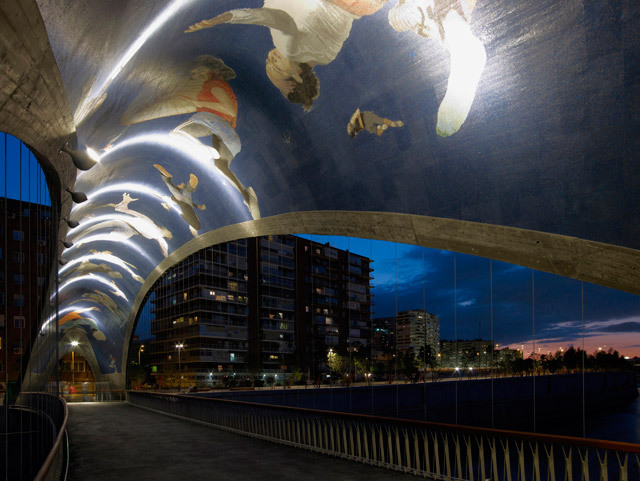 In the edge of the ceiling the lighting is included which illuminates the artwork and the deck by reflection.